Choroidal neovascularisation (CNV) is a common vision-threatening complication of myopia and pathological myopia. Despite significant advances in understanding the epidemiology, pathogenesis and natural history of myopic CNV, there is no standard definition of myopic CNV and its relationship to axial length and other myopic degenerative changes. Several treatments are available to ophthalmologists, but with the advent of new therapies there is a need for further consensus and clinical management recommendations. Verteporfin photodynamic therapy has been an established treatment for subfoveal myopic CNV for many years, but this treatment does not restore visual acuity and is associated with long-term chorioretinal atrophy. More recently, clinical trials investigating the efficacy and safety of anti-vascular endothelial growth factor agents in patients with myopic CNV have demonstrated substantial visual acuity gains and quality of life increases compared with photodynamic therapy. These enhanced outcomes provide updated evidence-based clinical management guidelines of myopic CNV, and increase the need for a generally accepted definition for myopic CNV. This review critically summarises the latest myopic CNV literature in the context of clinical experience and recommends a myopic CNV treatment algorithm. Myopic choroidal neovascularisation (CNV) is a common vision-threatening complication of myopia and pathological myopia (PM).1–4 The clinical definition and terminology surrounding myopic CNV varies, with myopic CNV also commonly being referred to as subretinal neovascularisation in PM, Fuchs’ spot or Forster–Fuchs’ retinal spot in PM, and disciform degeneration in PM. While myopic CNV is historically thought to only occur in eyes with PM, it is now recognised that myopic CNV can occur at any degree of myopia and in eyes without typical myopic degenerative fundus changes.5 ,6 Therefore, in clinical practice, CNV can be attributed to be ‘myopic’ in aetiology by the refractive status of the eye and the exclusion of other disorders associated with CNV. There are now effective therapeutic options for myopic CNV, in particular anti-vascular endothelial growth factor (VEGF) therapy. This review summarises current concepts in pathogenesis, epidemiology, natural history, and management options for myopic CNV. Differential diagnosis for myopic choroidal neovascularisation (CNV): (A and B) haemorrhage due to lacquer cracks; (C) dome-shaped macula with serous retinal detachment; and (D and E) macular fluid due to staphyloma. A recent systematic review has indicated that the prevalence of PM is 1–3% in adults, and that 5–11% of patients with PM develop CNV.23 While these data provide some insight into the epidemiology of myopic CNV, the results should be interpreted with caution, since the definitions of myopia, PM and myopic CNV between studies were not uniform.23 Furthermore, the data were based on only a few published studies, indicating the need for further incidence and prevalence studies in different populations. 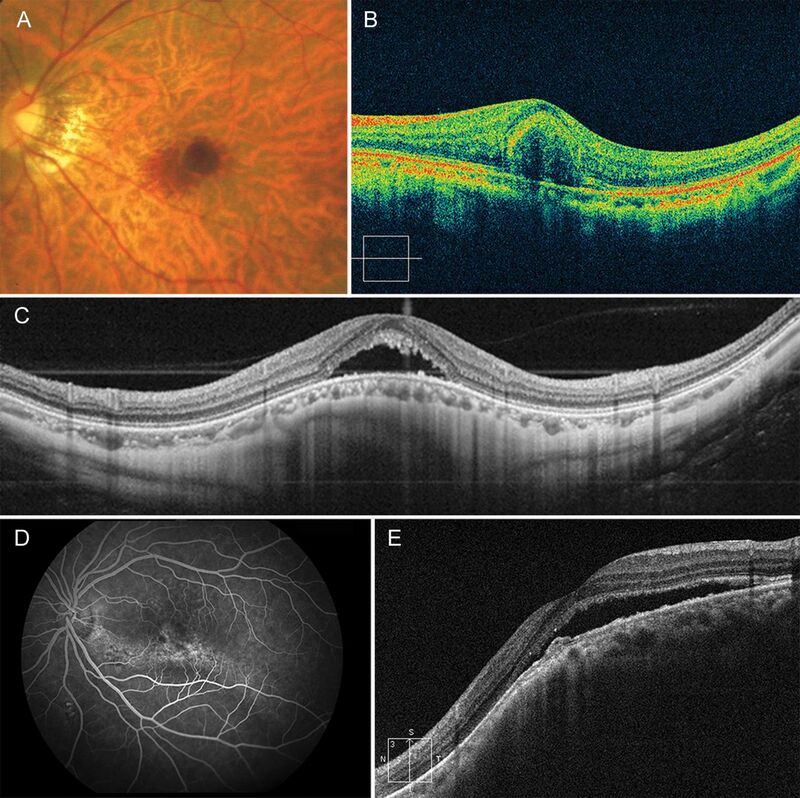 Active myopic choroidal neovascularisation (CNV) imaged via (A) colour fundus photography; (B) fluorescein angiography; and (C) optical coherence tomography. (D) A fibrous pigmented scar (Fuchs’ spot). (E) Chorioretinal atrophy following regression of active myopic CNV. 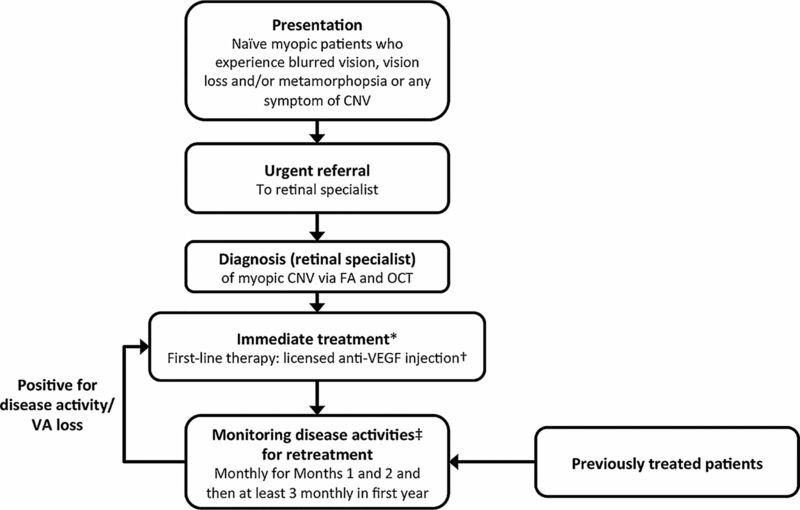 Before the introduction of intravitreal anti-VEGF therapy for CNV, laser photocoagulation, verteporfin photodynamic therapy (vPDT) and surgical excision or macular translocation were performed to treat CNV. These were recently reviewed elsewhere4; the most common treatments are summarised below. The 12-month, randomised RADIANCE trial (N=277) assessed the efficacy and safety of ranibizumab, administered under two different pro re nata (PRN) schedules for myopic CNV compared with vPDT.52 Patients receiving PRN ranibizumab were treated according to two criteria: visual acuity stabilisation criteria (no treatment if no change in BCVA compared with two preceding monthly visits) or disease activity criteria (treatment if there is vision impairment attributable to intraretinal or subretinal fluid, or active leakage secondary to PM as assessed by OCT and/or FA). RADIANCE also revealed significant improvements in several quality of life parameters (ie, Visual Functioning Questionnaire 25 composite, general vision, mental health and dependency subscale scores) for patients treated with ranibizumab compared with vPDT, which were maintained through to 12 months (K Ohno-Matsui et al, ARVO Annual Meeting, Seattle, USA, 2013). Bevacizumab (Avastin) is not approved for intraocular use, and evidence on its safety and efficacy profile is limited.75 ,76 Increasing concerns regarding its safety have been raised, particularly with regards to the increased risk of cardiovascular events (eg, stroke) compared with ranibizumab,77 ,78 and the potential risk of infection after repackaging the drug for intravitreal use.78 ,79 Despite this, bevacizumab is used by many ophthalmologists, and several retrospective and prospective studies have shown increases in visual acuity of between 4 and 18 letters after 12 months (table 2).64–74 ,80–82 However, these studies are small and provide lower levels of evidence. Additionally, comparisons between trials should be made with caution, due to differences in study designs, patient populations etc. Recent data have shown that the initial gains in visual acuity may not be maintained up to 5 years after treatment, and that this is associated with retinal thinning (V Sarao et al, ARVO Annual Meeting, Seattle, USA, 2013). This could indicate the development of chorioretinal atrophy, and like vPDT, it is not yet known whether this is related to treatment. However, a 4-year follow-up of 92 patients treated with bevacizumab (n=68) or ranibizumab (n=24) has shown good long-term outcomes, with changes in visual acuity of 9.4 letters at 12 months and 7.0 letters at 48 months (mean of 4.9 injections).83 Variability in treatment responses with anti-VEGF therapies in eyes with myopic CNV has been attributed to the size of the CNV lesion at baseline and the presence of single nucleotide polymorphisms in the VEGF gene.84 ,85 Further studies with larger numbers of patients are required to determine long-term outcomes with anti-VEGF therapies and prognostic factors for treatment responses. As there have been no large prospective, randomised clinical trials with bevacizumab in myopic CNV, the optimal dosing frequency has not been established. In two studies directly comparing bevacizumab with ranibizumab in patients with myopic CNV, there were similar improvements in BCVA,86 ,87 but the number of bevacizumab injections required was significantly higher in one study (4.7 vs 2.6, p=0.0004).87 This may indicate an increased treatment burden with bevacizumab, but further studies are required. The efficacy and safety of aflibercept (Eylea) for myopic CNV was evaluated in the ongoing phase III, multicentre, randomised, sham-controlled, 12-month MYRROR study in Asian patients (N=121; NCT01249664).88 Patients received aflibercept according to a PRN schedule based on visual and anatomical criteria.89 Interim 6-month results reported a 12.1-letter improvement in BCVA compared with a 2-letter loss in those receiving sham injection,89 and recent reports indicate sustained BCVA gains up to 12 months (K Ohno-Matsui et al, AAO Annual Meeting, New Orleans, USA, 2013). Based on the evidence above, the following clinical management algorithm is proposed for diagnosis and treatment of myopic CNV (figure 3). Treatment algorithm for myopic CNV. *Ranibizumab is the only licensed anti-VEGF therapy for myopic CNV. Other anti-VEGFs (eg, bevacizumab and aflibercept) are not currently approved for myopic CNV. †Initiated with a single injection. ‡Monitoring for disease activity may include clinical examination, OCT or FA. If monitoring reveals signs of disease activity (reduced VA, blurred vision, metamorphopsia and/or lesion activity), further treatment is recommended. CNV, choroidal neovascularisation; OCT, optical coherence tomography; FA, fluorescein angiography; VA, visual acuity; VEGF, vascular endothelial growth factor. Patients with myopia and reduced vision, central scotoma and/or metamorphopsia should be referred to a retinal specialist. An early or urgent referral is recommended due to the potential for severe visual loss associated with the active stage of myopic CNV.3 ,26 ,31 Myopic CNV may also regress spontaneously resulting in chorioretinal atrophy (figure 3), and the retinal specialist could lose the opportunity to treat the active CNV. Slit lamp biomicroscopy examination and imaging (FA and OCT) should be used to diagnose myopic CNV and differentiate it from other causes of CNV and other causes of visual loss associated with PM. ICGA may be required in selected cases. Patients with extrafoveal CNV should also receive immediate treatment, as CNV-related chorioretinal atrophy could develop and affect central vision. In this instance, patients can also receive first-line treatment with anti-VEGF therapy, as the RADIANCE trial included patients with extrafoveal CNV.52 However, vPDT could also be used when anti-VEGF therapy is not available or contraindicated. If there is no disease activity after the initial injection and the two successive monthly visits, three-monthly visits may be considered for the first year.91 For some patients, quarterly monitoring may result in under treatment, so patients should be educated to re-present to the retinal specialist if they experience any decrease in vision or recurrence of metamorphopsia. More frequent monitoring and treatment could be established by the treating retinal specialist if there is evidence of disease activity. After 1 year, the monitoring frequency should be established by the retinal specialist in consultation with the patient,91 and the patient should be advised to return if they experience any drop in vision. During monitoring, the treating retinal specialist should also check for additional pathologies, such as myopic traction maculopathy (foveoschisis), macular hole, retinal tears and rhegmatogenous detachments, which can also be causes of visual loss and require different treatments.92–95 This is particularly important for myopic traction maculopathy, as the acute shrinkage of CNV by anti-VEGF therapy can worsen a pre-existing retinoschisis.96 Patients with PM and myopic CNV should also be educated about the symptoms of these other retinal complications. Treatment of myopic CNV with anti-VEGF agents allows promise of substantial visual acuity gain and quality of life. In particular, there is now a high level of evidence for the use of ranibizumab, the only anti-VEGF agent currently licensed, for treatment of myopic CNV, although others such as aflibercept are being evaluated in clinical trials. While the proposed treatment algorithm is based on the current knowledge and experience gained to date, further research will establish the best management strategy, dosing frequency and timing of injection and monitoring. The authors thank Elizabeth Hutchinson (Fishawack Communications Ltd, UK) for medical writing and editorial assistance towards development of this manuscript, supported by Novartis Pharma AG.
. Natural history of choroidal neovascularization in degenerative myopia. Ophthalmology 1984;91:1573–81.
. Natural history of Fuchs’ spot: a long-term follow-up study. Doc Ophthal Proc Series 1981;28:215–21.
. Visual prognosis of disciform degeneration in myopia. Ophthalmology 1983;90:923–6.
. Choroidal neovascularization in pathological myopia. Prog Retin Eye Res 2012;31:495–525.
. Genetic factors for choroidal neovascularization associated with high myopia. Invest Ophthalmol Vis Sci 2012;53:5004–9.
. Ocular risk factors for choroidal neovascularization in pathologic myopia. Invest Ophthalmol Vis Sci 2010;51:3721–5.
. Induction of vascular endothelial growth factor after application of mechanical stress to retinal pigment epithelium of the rat in vitro. Invest Ophthalmol Vis Sci 1999;40:3287–91.
. Long-term pattern of progression of myopic maculopathy: a natural history study. Ophthalmology 2010;117:1595–611.
. Vascular endothelial growth factor gene polymorphisms and choroidal neovascularization in highly myopic eyes. Invest Ophthalmol Vis Sci 2012;53:2349–53.
. Evaluation of pigment epithelium-derived factor and complement factor I polymorphisms as a cause of choroidal neovascularization in highly myopic eyes. Invest Ophthalmol Vis Sci 2013;54:4208–12.
. Choroidal filling delay in choroidal neovascularisation due to pathological myopia. Br J Ophthalmol 2010;94:611–15.
. Macular complications associated with posterior staphyloma. Am J Ophthalmol 1997;123:181–7.
. Choroidal neovascularisation in pathological myopia: an update in management. Br J Ophthalmol 2005;89:1522–8.
. Natural history of choroidal neovascularization in high myopia. Curr Opin Ophthalmol 2001;12:222–4.
. Choroidal neovascularization in pathologic myopia: recent developments in diagnosis and treatment. Surv Ophthalmol 2008;53:121–38. Verteporfin in Photodynamic Therapy Study Group. Photodynamic therapy of subfoveal choroidal neovascularization in pathologic myopia with verteporfin. 1-year results of a randomized clinical trial—VIP report no. 1. Ophthalmology 2001;108:841–52.
. Characterization of macular lesions in punctate inner choroidopathy with spectral domain optical coherence tomography. J Ophthalmic Inflamm Infect 2012;2:113–20.
. Characteristic spectral-domain optical coherence tomography findings of multifocal choroiditis. Retina 2011;31:717–23.
. Punctate inner choroidopathy. Am J Ophthalmol 1984;98:572–84.
. Myopic maculopathy: a review. Ophthalmologica 2012;228:197–213.
. Epidemiology and disease burden of pathologic myopia and myopic choroidal neovascularization: an evidence-based systematic review. Am J Ophthalmol 2014;157:9–25 e12.
. Angiographic and optical coherence tomography characteristics of recent myopic choroidal neovascularization. Am J Ophthalmol 2013;155:913–19.
. Parapapillary atrophy: histological gamma zone and delta zone. PLoS One 2012;7:e47237.
. Estimation of visual outcome without treatment in patients with subfoveal choroidal neovascularization in pathologic myopia. Graefes Arch Clin Exp Ophthalmol 2006;244:1474–9.
. Characteristics of patients with a favorable natural course of myopic choroidal neovascularization. Graefes Arch Clin Exp Ophthalmol 2005;243:13–19.
. Pathologic myopia and choroidal neovascularization. Am J Ophthalmol 1981;91:177–83.
. Visual acuity outcomes of patients 50 years of age and older with high myopia and untreated choroidal neovascularization. Ophthalmology 1999;106:2063–7.
. Long-term visual acuity after argon green laser photocoagulation of juxtafoveal choroidal neovascularization in highly myopic eyes. Eur J Ophthalmol 2002;12:117–22.
. Pathologic myopia: where are we now? Am J Ophthalmol 2002;134:645–60.
. Laser photocoagulation for choroidal neovascularisation in pathologic myopia. Cochrane Database Syst Rev 2005:CD004765.
. Outcome of photodynamic therapy in choroidal neovascularization due to pathologic myopia and related factors. Int Ophthalmol 2012;32:119–25.
. Combined photodynamic therapy and intravitreal triamcinolone injection for the treatment of choroidal neovascularisation secondary to pathological myopia: a pilot study. Br J Ophthalmol 2007;91:174–9.
. Photodynamic therapy for Taiwanese patients with pathologic myopia: a 2-year follow-up. Retina 2007;27:839–45.
. Twofold illumination photodynamic therapy scheme for subfoveal choroidal neovascularization in pathologic myopia: results from a randomized pilot study. Retina 2006;26:757–64.
. Long-term results of photodynamic therapy for choroidal neovascularization in Japanese patients with pathologic myopia. Am J Ophthalmol 2011;151:137–47 e1.
. Photodynamic therapy with verteporfin for choroidal neovascularization of pathologic myopia in Japanese patients: comparison with nontreated controls. Am J Ophthalmol 2008;145:518–26.
. Choroidal neovascularization in pathologic myopia: three-year results after photodynamic therapy. Am J Ophthalmol 2005;140:416–25.
. Photodynamic therapy with verteporfin for subfoveal choroidal neovascularisation of pathologic myopia in Chinese eyes: a prospective series of 1 and 2 year follow up. Br J Ophthalmol 2004;88:1315–19.
. Verteporfin photodynamic therapy in highly myopic subfoveal choroidal neovascularisation. Br J Ophthalmol 2003;87:173–6.
. Photodynamic therapy with verteporfin for subfoveal choroidal neovascularization secondary to pathologic myopia: long-term study. Retina 2006;26:746–51.
. A long-term study of photodynamic therapy with verteporfin for choroidal neovascularization at the edge of chorioretinal atrophy in pathologic myopia. Ophthalmologica 2011;225:161–8.
. Photodynamic therapy with verteporfin for juxtafoveal choroidal neovascularization in pathologic myopia: a long-term follow-up study. Am J Ophthalmol 2007;143:449–54.
. Photodynamic therapy in highly myopic eyes with choroidal neovascularization: 5 years of follow-up. Retina 2011;31:1089–94.
. Long-term results of photodynamic therapy for subfoveal choroidal neovascularization with pathologic myopia. Retina 2012;32:1547–52.
. Quantitative assessment of the long-term effect of photodynamic therapy in patients with pathologic myopia. Graefes Arch Clin Exp Ophthalmol 2005;243:829–33.
. Verteporfin therapy of subfoveal choroidal neovascularization in pathologic myopia: 2-year results of a randomized clinical trial—VIP report no. 3. Ophthalmology 2003;110:667–73.
. RADIANCE: a randomized controlled study of ranibizumab in patients with choroidal neovascularization secondary to pathologic myopia. Ophthalmology 2014;121:682–92.
. Ranibizumab in myopic choroidal neovascularization: the 12-month results from the REPAIR study. Ophthalmology 2013;120:1944–5.
. Ranibizumab for the treatment of choroidal neovascularisation secondary to pathological myopia: interim analysis of the REPAIR study. Eye (Lond) 2013;27:709–15. OCEBM Levels of Evidence Working Group. The Oxford Levels of Evidence 2. Oxford Centre for Evidence-Based Medicine. 2011. http://www.cebm.net/index.aspx?o=5653 (accessed 13 Nov 2013).
. Intravitreal ranibizumab for myopic choroidal neovascularization: factors predictive of visual outcome and need for retreatment. Am J Ophthalmol 2011;151:529–34.
. Long-term follow-up of myopic choroidal neovascularization treated with ranibizumab. Ophthalmologica 2012;227:39–44.
. Long-term outcome of intravitreal anti-vascular endothelial growth factor therapy with bevacizumab or ranibizumab as primary treatment for subfoveal myopic choroidal neovascularization. Eye (Lond) 2012;26:1004–11.
. Intravitreal ranibizumab for choroidal neovascularization secondary to pathologic myopia: 12-month results. Eye (Lond) 2009;23:1275–80, quiz 81.
. Intravitreal ranibizumab for myopic choroidal neovascularization: 12-month results. Retina 2010;30:407–12.
. Is ranibizumab effective in stopping the loss of vision for choroidal neovascularisation in pathologic myopia? A long-term follow-up study. Br J Ophthalmol 2011;95:657–61.
. Intravitreal ranibizumab for the primary treatment of choroidal neovascularization secondary to pathologic myopia. Retina 2009;29:750–6.
. Intravitreal anti-VEGF versus photodynamic therapy with verteporfin for treatment of myopic choroidal neovascularization. Retina 2010;30:418–24.
. Intravitreal bevacizumab for choroidal neovascularization attributable to pathological myopia: one-year results. Am J Ophthalmol 2009;147:94–100 e1.
. Intravitreal bevacizumab treatment for choroidal neovascularization in pathologic myopia: 12-month results. Am J Ophthalmol 2009;147:84–93 e1.
. Myopic choroidal neovascularization treated by intravitreal bevacizumab: comparison of two different initial doses. 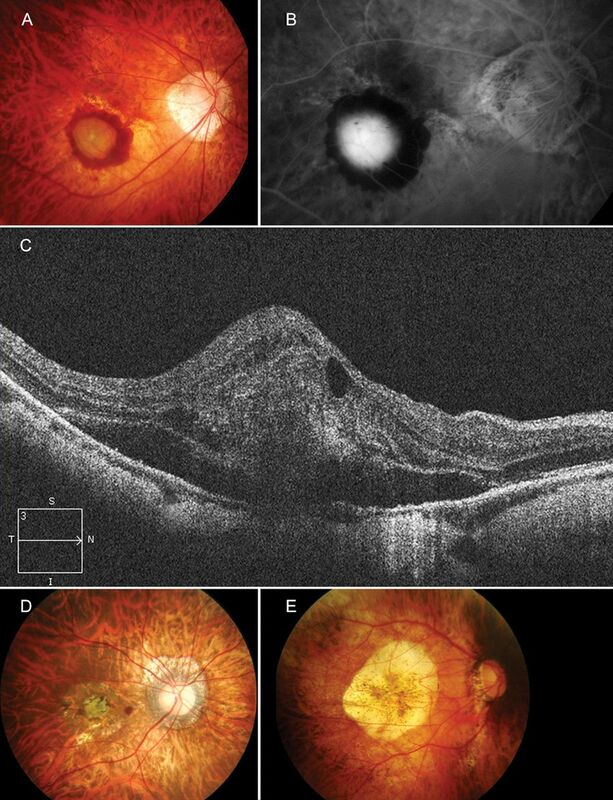 Graefes Arch Clin Exp Ophthalmol 2011;249:595–9.
. Twelve-month outcome after one intravitreal injection of bevacizumab to treat myopic choroidal neovascularization. Retina 2010;30:1609–15.
. Myopic choroidal neovascularization. Ophthalmology 2011;118:2521–3.
. Intravitreal bevacizumab in myopic neovascular membranes: 24-month results. Ophthalmology 2013;120:1510–11 e1.
. Intravitreal bevacizumab therapy on an as-per-needed basis in subfoveal choroidal neovascularization secondary to pathological myopia: 2-year outcomes of a prospective case series. Retina 2011;31:1841–7.
. Long-term results of intravitreal bevacizumab for choroidal neovascularisation in pathological myopia. Br J Ophthalmol 2012;96:1068–72.
. Two-year outcomes of intravitreal bevacizumab for choroidal neovascularization in Japanese patients with pathologic myopia. Retina 2012;32:687–95.
. Risks of mortality, myocardial infarction, bleeding, and stroke associated with therapies for age-related macular degeneration. Arch Ophthalmol 2010;128:1273–9.
. Cardiac issues of noncardiac drugs: the rising story of Avastin in age-related macular degeneration. Ophthalmologica 2014;231:75–9. US Food and Drug Administration. Potential use of Avastin in the treatment of wet age-related macular degeneration. 2011. http://www.fda.gov/Drugs/DrugSafety/ucm270296.htm (accessed 11 Jul 2013).
. Prognostic factors for visual outcomes 2-years after intravitreal bevacizumab for myopic choroidal neovascularization. Eye (Lond) 2011;25:375–81.
. Laser photocoagulation, photodynamic therapy, and intravitreal bevacizumab for the treatment of juxtafoveal choroidal neovascularization secondary to pathologic myopia. Arch Ophthalmol 2010;128:437–42.
. Central retinal sensitivity after intravitreal injection of bevacizumab for myopic choroidal neovascularization. Am J Ophthalmol 2009;147:816–24, 24 e1.
. Intravitreal anti-VEGF therapy for choroidal neovascularisation secondary to pathological myopia: 4-year outcome. Br J Ophthalmol 2013;97:1447–50.
. Prognostic factors of eyes with naïve subfoveal myopic choroidal neovascularization after intravitreal bevacizumab. Am J Ophthalmol 2013;156:1201–10 e2.
. Vascular endothelial growth factor gene and the response to anti-vascular endothelial growth factor treatment for choroidal neovascularization in high myopia. Ophthalmology 2014;121:225–33.
. Choroidal neovascularization in pathologic myopia: intravitreal ranibizumab versus bevacizumab—a randomized controlled trial. Am J Ophthalmol 2010;149:458–64 e1.
. Intravitreal ranibizumab versus bevacizumab for treatment of myopic choroidal neovascularization. Retina 2012;32:1539–46. ClinicalTrials.gov. VEGF trap-eye in choroidal neovascularization secondary to pathologic myopia (mCNV) (MYRROR). 2012. http://clinicaltrials.gov/ct2/show/NCT01249664?term=aflibercept+AND+myopia&rank=1 (accessed 1 Jul 2013). Bayer HealthCare. Positive phase 3 results for VEGF Trap-Eye (intravitreal aflibercept) in myopic choroidal neovascularization (mCNV). 2013. http://press.healthcare.bayer.com/en/press/auth/news-details-page.php/15070/2013–0317 (accessed 25 Jul 2013).
. Intravitreal anti-vascular endothelial growth factor for choroidal neovascularization secondary to pathologic myopia: systematic review and meta-analysis. Retina 2013;33:1375–92. Novartis. Lucentis summary of product characteristics. 2012. http://www.ema.europa.eu/docs/en_GB/document_library/EPAR_-_Product_Information/human/000715/WC500043546.pdf (accessed 13 Nov 2013).
. Prevalence of posterior vitreous detachment in high myopia. Ophthalmology 1993;100:1384–8.
. Macular hole and myopic refraction. Br J Ophthalmol 2002;86:1269–73.
. Peripheral retinal degenerations and the risk of retinal detachment. Am J Ophthalmol 2003;136:155–60.
. Pathology of macular foveoschisis associated with degenerative myopia. J Ophthalmol 2010;2010:175613. Contributors At all stages the authors have had control over the content of this manuscript, for which they have given final approval and take full responsibility. TYW was the lead author and took overall responsibility for the scientific accuracy, flow and content of the manuscript. AT was responsible for the overall integrity of the manuscript and acts as the guarantor in accordance with ICJME requirements. Funding Medical writing services and publication costs were supported by Novartis Pharma AG. Competing interests TYW reports grants, personal fees, travel support and writing/reviewing fees from Novartis and Bayer, and has served as a consultant for Abbott, Allergan, Bayer, Genentech, Novartis, Roche, and Pfizer; KO-M has nothing to disclose; NL reports personal fees and non-financial support from Allergan, Bayer and Novartis, and grants from Théa; FGH reports advisory board remuneration from Acucela, Alcon, Bayer, Genentech, Heidelberg Engineering, Merz, Novartis and Roche; TYL reports advisory board and consultancy remuneration from Allergan, Bayer, Novartis, and lecture fees from Alcon, Allergan, Bausch & Lomb, Bayer Healthcare, Heidelberg Engineering and Novartis; HGY reports grants from Allergan, Bayer and Novartis; PL is a consultant for Alcon, Allergan, Bausch & Lomb, Bayer, Novartis, Roche and Teva; YC reports advisory board remuneration from Novartis; AT reports advisory board remuneration from Alcon, Allergan, Bayer, Novartis, Roche, Genentech, Heidelberg Engineering, Pfizer and ThromboGenics.